dDepartment of Neuroradiology (S.M. ), University Hospital Freiburg, Freiberg, Germany. BACKGROUND AND PURPOSE: The published results of treating internal carotid artery aneurysms with the PED do not necessarily apply to its use in the posterior circulation because disabling brain stem infarcts can be caused by occlusion of a single perforator. In this multicenter study, we assessed the safety of PED placement in the posterior circulation. MATERIALS AND METHODS: A prospective case registry was maintained of all posterior circulation aneurysms treated with PEDs at 3 Australian neurointerventional centers during a 27-month period. The objective was to assess the complications and aneurysm occlusion rates associated with posterior circulation PEDs. RESULTS: Thirty-two posterior circulation aneurysms were treated in 32 patients. No deaths or poor neurologic outcomes occurred. Perforator territory infarctions occurred in 3 (14%) of the 21 patients with basilar artery aneurysms, and in all 3, a single PED was used. Two asymptomatic intracranial hematomas were recorded. No aneurysm rupture or PED thrombosis was encountered. The overall rate of permanent neurologic complications was 9.4% (3/32); all 3 patients had very mild residual symptoms and a good clinical outcome. Aneurysm occlusion was demonstrated in 85% of patients with >6 months of follow-up and 96% of patients with >1 year of follow-up. CONCLUSIONS: The PED is effective in the treatment of posterior circulation aneurysms that are otherwise difficult or impossible to treat with standard endovascular or surgical techniques, and its safety is similar to that of stent-assisted coiling techniques. A higher clinical perforator infarction rate may be associated with basilar artery PEDs relative to the internal carotid artery. The introduction of the PED (Chestnut Medical Technologies, Menlo Park, California) was a significant addition to the endovascular treatment options for anterior circulation intracranial aneurysms. Published registries have documented excellent aneurysm closure results with safety profiles comparable with or better than balloon-assisted or stent-supported coiling.1⇓⇓⇓⇓–6 Most cases included in publications to date are of anterior circulation aneurysms, mostly in the internal carotid artery, and the growing body of evidence can be reasonably applied to this anatomic subset.1⇓⇓⇓⇓–6 The relative paucity of posterior circulation aneurysms in the larger published series and the case reports of delayed thrombosis of posterior circulation PEDs serve as a reminder that experience and data associated with using PEDs to treat internal carotid artery aneurysms does not automatically apply to their use in the posterior circulation. The purpose of this multicenter prospective registry was to analyze the safety and results of using PEDs to treat posterior circulation aneurysms. A prospective case registry was maintained of consecutive posterior circulation aneurysms treated with PEDs at 3 Australian neurointerventional centers between August 2009 and October 2011. The study included 32 patients, 21 of them female (ratio 1:1.91) (age range, 15–78 years; mean, 52 years; median, 52 years). Sixteen patients were current or ex-smokers. Seventeen cases are also included in other publications.5,7 Data were prospectively collected on patient demographics, clinical parameters, aneurysm characteristics, antiplatelet and anticoagulation regimens, and technical and clinical complications. The cases are detailed in the On-line Table. All aneurysms included were judged by a multidisciplinary team as not satisfactorily treatable by standard endovascular or surgical techniques. Written informed consent was obtained from all patients and/or their families. Before the TGA approval of the PED, individual applications were made to the hospital administration and the TGA for use of the device on compassionate grounds. All patients were loaded with clopidogrel (Plavix) and aspirin preoperatively. One center had access to point-of-care P2Y12 inhibition testing (VerifyNow; Accumetrics, San Diego, California), which allowed customization of loading schedules in response to inhibition levels. For elective procedures, most patients were prescribed 5–7 days of either 75 mg or 150 mg daily of clopidogrel. Dosing regimens varied between centers, with 1 center preferring a shorter term, higher dose schedule of 300 mg daily for 2 days. Shorter regimens were used in cases of recent SAH, in most, 300 or 600 mg of clopidogrel on the day of the procedure. All patients were prescribed dual antiplatelet therapy postoperatively. The duration varied with operator preference and patient compliance. Two patients stopped taking clopidogrel prematurely at 2 weeks (patient 16) and 3 months (patient 4). In 3 patients, the clopidogrel was stopped at 3 months, after aneurysm occlusion was demonstrated. In patient 9, the clopidogrel was stopped at 5 months to treat persistent aneurysm filling. Presently, clopidogrel has been stopped in 24 of 32 patients, 10 at 6 months or earlier, 5 between 6 and 12 months, and 9 at ≥12 months. In the 8 still taking clopidogrel, 7 are <6 months posttreatment, and 1 is between 6 and 12 months post-PED. All patients were heparinized during stent deployment, titrated to an activated clotting time of >250 seconds or twice the baseline. All patients were heparinized postoperatively with a target activated partial thromboplastin time 2× normal. The duration varied with operator preference, 21 patients for 13–24 hours, 10 for >24 hours, and 1 for <24 hours. In 1 case involving sacrifice of a vertebral artery (patient 18), anticoagulation was continued for 1 week with subcutaneous enoxaparin. All procedures were performed with the patient under general anesthetic by interventional neuroradiologists. Using a coaxial or triaxial guide-catheter system, we deployed all PEDs through a Marksman microcatheter (ev3; Irvine, California) under digital-subtraction fluoroscopy. A subjective decision about the number of PEDs was made by the operator at the time. Additional PEDs were used to bridge the neck of fusiform aneurysms, eliminate the impression of an inflow jet into the aneurysm post-PED, or decrease the aneurysm emptying relative to the parent vessel. Incomplete opening of a PED was remedied with balloon angioplasty when needed (HyperGlide; ev3) in 10 aneurysms. If used, endosaccular coils were deployed either before the PED or through a jailed microcatheter. All patients were seen and examined by interventional neuroradiologists immediately postoperatively, daily during their inpatient admission, and in the outpatient clinic at 1, 3, and 6 months after discharge. Additional independent follow-up was also routinely performed by the referring neurologist or neurosurgeon, and all patients with neurologic complications were independently assessed by a neurologist. Clinical and imaging follow-up ranged from 4 to 39 months (mean, 21 months; median, 22 months) and was >6 months in 28/32 cases. CTA (if no coils were present) and MR imaging were used at various time points in several patients, depending on the clinical need. All patients had either CTA or MR imaging in the first 3 months. Twenty-seven patients have undergone a 6-month DSA; in patient 10, this was withheld due to renal failure, but aneurysm occlusion was demonstrated on MRA. Patients 29–32 are scheduled to have 6-month DSA in the next 60 days. Imaging findings detailing the presence of aneurysm occlusion, in-construct stenosis, and silent infarction were assessed. Delayed clinical complications and ongoing antiplatelet therapy compliance were assessed. The primary objective of this study was to assess the complications associated with deploying PEDs in the posterior circulation. The outcome end points of this study are clinical complications and aneurysm occlusion. Twenty asymptomatic aneurysms were treated in 20 patients. Four aneurysms in 4 patients were treated after presentation with a focal acute2 or chronic2 mass-induced neurologic deficit. 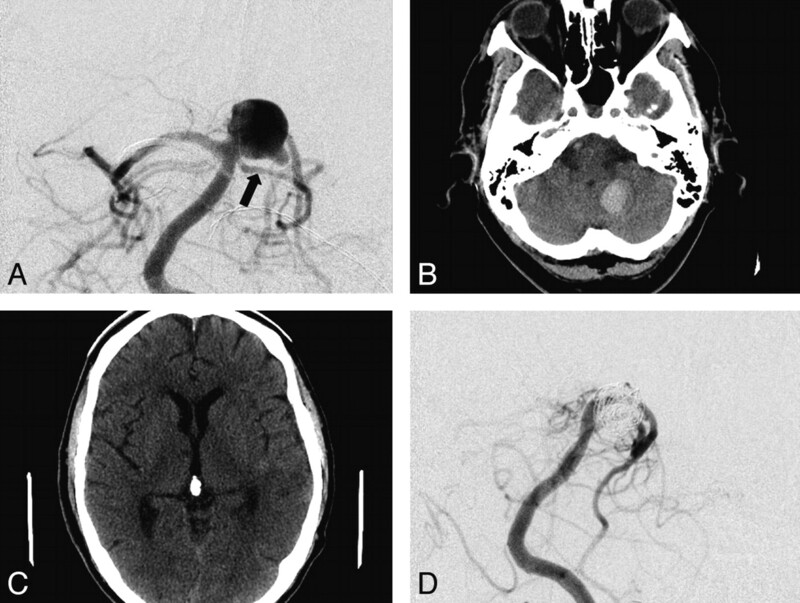 Eight aneurysms in 8 patients were treated with PEDs after recent rupture and SAH. Treatment was on days 0, 1, 2, 3, 11, 21, 24, and 26 post-SAH. Six were good clinical grades (WFNS 0–1), and 2 were poor grades (WFNS 4–5). Two of the 8 patients with SAH were treated with PEDs after primary treatment with coiling (patient 9) and stent-coiling (patient 20) resulting in acute aneurysm recurrence during the same admission. Of the 20 asymptomatic patients, 6 had been previously treated with stent-coiling; 1, with coiling alone; and 1 was previously clipped. Neither of the 2 patients with acute mass effect had been previously treated. One of the 2 patients with chronic mass effect had been previously coiled. Twelve berry aneurysms were included; 11 of these were wide-neck (dome/neck <1:6 or neck ≥4 mm), and 7 incorporated branch vessels. Twenty aneurysms classified as fusiform, blister, sidewall, or dissecting were included. Aneurysm size raged from 2 to 30 mm (mean, 9.7 mm; median, 10 mm). In 21 patients, PED constructs were partially or entirely deployed within the basilar artery. Eleven of these were basilar tip–posterior cerebral artery P1 segment aneurysms, 8 were basilar trunk aneurysms, and 2 were vertebrobasilar junction aneurysms. Seven vertebral artery lesions, 1 posterior inferior cerebral artery lesion, and 3 posterior cerebral artery lesions were treated with PED constructs in the parent artery without involvement of the basilar artery. Only patient 4 had overlapping PEDs within the normal basilar artery. The first PED migrated downward for >5 minutes, uncovering the 2-mm blister sidewall aneurysm in the distal basilar trunk. A second PED was deployed with no adverse sequelae. Forty-seven PEDs were deployed in 32 patients to treat 32 aneurysms. In 1 patient, 4 PEDs were used to form the construct, in 2 patients 3 PEDs, and in 8 patients 2 PEDs were used. Calibers ranged from 2.5 to 4.75 mm (median, 3.25 mm; lengths, 10–30 mm; median, 18 mm). In 11 patients (6 asymptomatic, 4 SAH, and 1 acute mass effect), endosaccular coils were also deployed. Coil sacrifice of the contralateral vertebral artery distal to the posterior inferior cerebral artery origin was performed in all 3 patients with vertebrobasilar junction aneurysms (patients 3, 16, and 18). After PED deployment across the junction of the ipsilateral vertebral artery and the basilar artery, the contralateral vertebral artery filled the aneurysm sac. This necessitated sacrifice of this vertebral artery (Fig 1). Patient 18 was a 43-year-old man who presented with WFNS grade 4 SAH. A multilocular vertebrobasilar junction aneurysm at a fenestration was treated with stent-assisted Enterprise (Cordis, Miami Lakes, Florida) coiling, with the stent in the left limb of the fenestration. The patient had a stormy course, including symptomatic vasospasm requiring angioplasty, but made an excellent recovery. 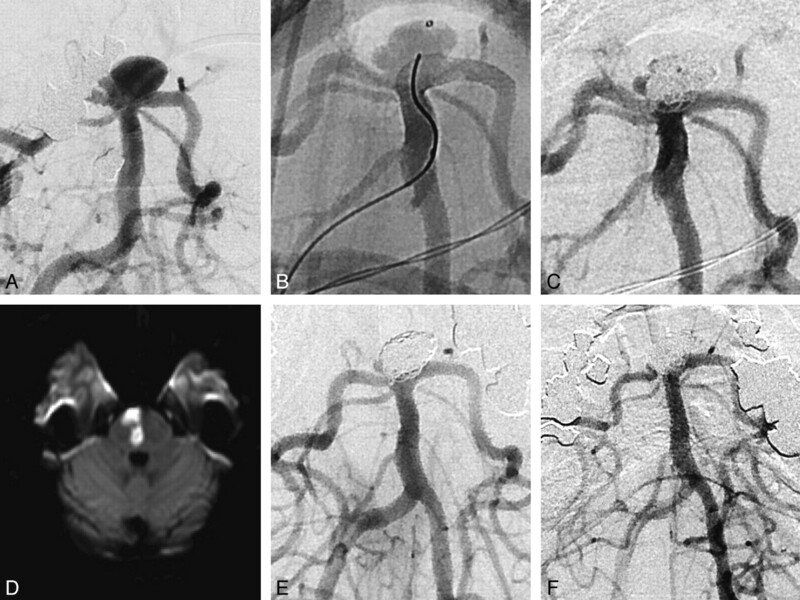 Follow-up angiography documents a growing aneurysm and some compaction. A, B, C, and D, Anteroposterior subtracted DSA studies. A, Filling of the aneurysm from the right and left sides (black arrow at the approximate margin of Enterprise stent). A PED was placed within the left vertebrobasilar Enterprise stent, and the endoleak was treated with coil occlusion of the right vertebral artery and a right fenestrated limb (B and C). Follow-up angiogram (D) at 12 months documents patency of the construct without aneurysm filling. A single patient had a groin hematoma, which resolved without treatment. A recurrent multilobed vertebrobasilar junction aneurysm in a 37-year-old man had originally been treated with stent-assisted coiling after SAH 1 year earlier (patient 18). The recanalized aneurysm was treated with a PED spanning the distal left vertebral and proximal basilar arteries, with coil deconstruction of the right vertebral artery distal to the posterior inferior cerebral artery. He awoke from the procedure with unilateral right-sided deafness, no facial nerve weakness, and no cerebellar signs. MR imaging demonstrated no brain stem or cerebellar infarction. In the absence of an infarct at the cochlear nucleus, the presumption is that the eighth cranial nerve was damaged. An embolus into the labyrinthine artery (anterior inferior cerebellar artery branch) was possible, but the absence of a cerebellar or facial nerve infarction is unusual. Another possibility is a perforator infarct to the eighth nerve due to the ipsilateral vertebral artery sacrifice. His mRS score was 1 at 6-month follow-up. After PED and coil treatment of a ruptured fusiform basilar tip–posterior cerebral artery aneurysm, patient 7 was confused on day 1 postprocedure. CT demonstrated a left cerebellar tonsillar 2-cm hematoma and a small 5-mm anterior right thalamic lacune (Fig 2). The patient's confusion resolved within 48 hours, and he was discharged home 13 days post-SAH with an mRS score of 0 at 1 month. No other infarction was detected at 3-month MR imaging. Patient 7 was a 64-year-old man who presented with WFNS clinical grade 1 SAH. Anteroposterior (AP) subtracted DSA (A) documents a fusiform aneurysm of the right P1 segment (black arrow, left superior cerebellar artery). A single PED construct was placed from the basilar artery through the fusiform aneurysm into the distal P1-P2 junction, with coiling of the aneurysm sac. Postoperative CT at 24 hours (B and C) documents a small left cerebellar hemorrhage and a new mesial right anterior thalamic lacune. The patient made an excellent recovery and was discharged home on day 13 post-subarachnoid hemorrhage. Follow-up angiography at 12 months (AP subtracted DSA, D) documents occlusion of the aneurysm and patency of the cerebellar artery and P1 segment. An enlarging wide-neck 10-mm basilar tip aneurysm in a 56-year-old woman (patient 17) was treated electively with coils and a PED as a neck construct deployed from the left P1 posterior cerebral artery into the basilar trunk (Fig 3). No immediate complications were encountered. She re-presented to the hospital on day 25, with initially transient, then stuttering progressive hemianesthesia and dysarthria, while still taking clopidogrel and aspirin. On examination, she had left upper limb incoordination, mild upper limb weakness, and gait ataxia. MR imaging demonstrated an acute right ventral pontine (basilar perforating artery territory) infarct, and same-day DSA demonstrated a widely patent PED construct with no thrombus or visible branch artery occlusion. The patient had 2 old lacunes predating treatment. With rehabilitation, her brain stem signs improved greatly, and at 6 months, she had an mRS score of 1 as assessed by an independent neurologist. Patient 17 was a woman 56 years of age with a 6 × 10 mm (height × neck width) basilar tip aneurysm with rapid growth, measuring 2.5 mm 6 years previously. There was incorporation of the left P1 and, to a lesser extent, the right P1 with a patent left posterior communicating artery. The patient had a history of hypertension with triple medical therapy and depression. A, C, E, and F, Subtracted DSA anteroposterior images of the basilar artery. In view of the very unfavorable dome/neck ratio (0:6), we decided to use the PED as a stent-assist construct in this instance because the device would fill the vessel and markedly narrow the neck without “cutting the corners” as other coiling assist constructs tend to. The PED was placed in the left P1 (native image, B) because the right posterior communicating artery was hypoplastic. Coiling was successful with a small locule and maintenance of the posterior communicating artery on the left (C). The patient remained well with appropriate platelet inhibition. After she re-presented with a stroke, MR imaging (D) depicts a right paramedian pontine infarct at the level of the proximal third of the stent within the basilar artery. Angiography performed the same day (E) shows that the aneurysm is occluded, apart from a small side locule, and there is no in-construct stenosis or thrombosis. Follow-up angiography at 11 months (F) shows that the posterior communicating artery and stent are widely patent. The small right locule is significantly smaller. A 47-year-old woman with an unruptured basilar tip aneurysm was treated electively with a single PED from the left P1 posterior cerebral artery into the basilar trunk (patient 27). She had no neurologic deficit or any other complication in the first 72 hours postoperatively and was ready to be discharged from the hospital. On day 3, she reported sudden-onset visual and balance disturbances. On clinical examination, she had upbeat vertical nystagmus, impaired convergence, and difficulty with conjugate gaze on pursuit. During the next week, she developed right-leaning ataxia, and in weeks 2 and 3, she developed right-sided lower limb spasticity. MR imaging performed on days 4, 18, and 28 did not demonstrate any unequivocal brain stem lesions; however, the clinical picture was ascribed to a brain stem (basilar perforating artery territory) infarction by an independent neurologist. With rehabilitation, her deficits improved, with mild subjective hamstring tightness her only residuum. She returned to work at 3 months with an mRS score of 1, and on MR imaging on day 28, the aneurysm was occluded. 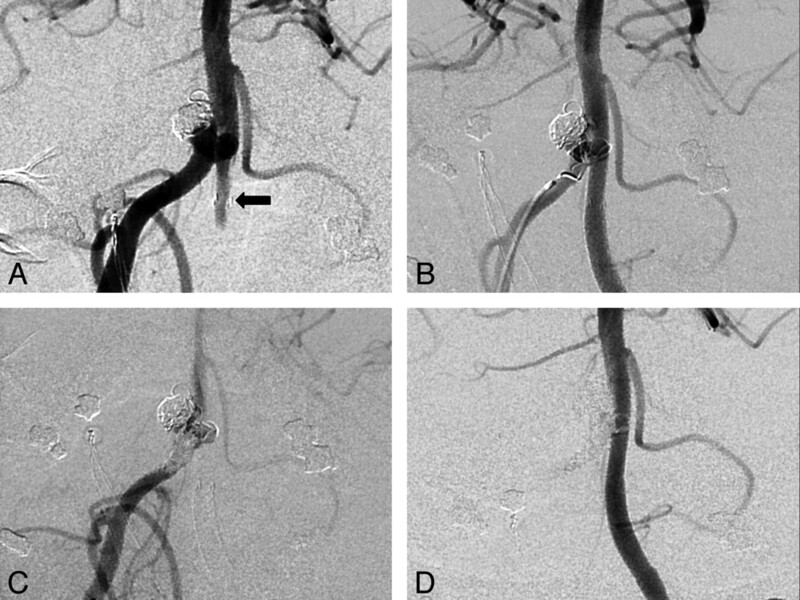 A 61-year-old woman with multiple vascular risk factors was treated with a PED and right vertebral artery sacrifice for a recurrent left vertebrobasilar junction aneurysm that had been originally treated with stent-assisted coiling and Onyx (ev3) embolization 7 years earlier (patient 16). At 2–3 months postprocedure, the patient stopped her aspirin and clopidogrel against medical advice. At 97 days postprocedure, the patient re-presented with a transient episode of expressive dysphasia. This resolved in <24 hours. No acute ischemic lesion was detected on MR imaging. She was reloaded with clopidogrel as a precaution and remains well. Complications Demonstrated on Imaging without Clinical Sequelae. All patients had parenchymal brain imaging with CT or MR imaging within 3 months of PED treatment. Patient 24 was a 48-year-old man treated with a construct of 2 PEDs for a 6 × 20 mm dissecting fusiform vertebral artery aneurysm on day 2 after WFNS grade 5 SAH. A postoperative CT demonstrated small bilateral retrocerebellar subdural hematomas. These were asymptomatic and resolved with conservative management. Patient 20 had in-construct stenosis without flow limitation demonstrated on 6-month DSA. On 12-month DSA, this had resolved. No aneurysms ruptured. No stent thrombosis was encountered. No poor neurologic outcomes (dependency or death) occurred. Three (9.4%) of 32 patients had permanent neurologic deficits (patients 17, 18, and 27). All 3 of these patients have only minor residual symptoms (loss of vocal volume, unilateral hamstring tightness, and unilateral deafness, respectively) and are independent and have returned to work (mRS 1). Three (9.4%) of the 32 cases were complicated by infarction in the territory of a perforator covered by the PED construct (patients 7, 17, and 27); the latter 2 of these had permanent neurologic deficits and were included in the group above. Patient 7 had a unilateral thalamic infarct with transient confusion but no permanent deficit. These patients represent 3 (14%) of the 21 with PED constructs in the basilar artery. None of these 3 patients had overlapping PEDs. One asymptomatic cerebellar hematoma (patient 7) and 1 asymptomatic subdural hematoma (patient 24) were detected. Twenty-four aneurysms have occluded. Of the 32 patients included in the study, 28 had >6 months' follow-up, and in 24 (86%) of these patients, aneurysm occlusion has been demonstrated. Twenty-three patients had >1 year follow-up, and in 22 (96%) of these patients, aneurysm occlusion was demonstrated. Aneurysm occlusion was demonstrated in all (100%) of the 8 patients with >2-year follow-up. Nine patients in whom coils were used with PEDs had >6-month imaging follow-up, and 7 of the aneurysms were occluded. Nine patients in whom the PED was deployed across the basilar bifurcation had >6-month imaging follow-up, and 7 of the aneurysms were occluded. A fusiform blister aneurysm of the left P1/P2 segment in patient 9 was treated with a PED and coils on day 11 post-WFNS grade 4 SAH after initial stent coiling (Solitaire; ev3) failed with rapid early aneurysm recurrence. At 18 months, a residual 4-mm bleb-like residuum remained, which had continued to increase in size after clopidogrel had been stopped at 5 months. At 22 months, 17 months after cessation of clopidogrel, complete aneurysm closure was demonstrated on DSA. Aneurysms Not Occluded beyond 12 Months. Patient 12 was a 69-year-old man who presented with acute brain stem compression from a 15-mm basilar artery sidewall aneurysm. This was treated with a construct of 2 PEDs and endosaccular coils. His clinical signs and the brain stem compression and edema on MR imaging resolved, but serial follow-up DSA and MRA demonstrated persistent aneurysm filling, probably due to marked angulation of his tortuous basilar artery at the level of the aneurysm. Twenty months after the initial treatment, a third PED was deployed in the construct across the aneurysm neck. This was well-tolerated, and imaging follow-up is pending. Most cases published to date are of internal carotid artery aneurysms,1,2,5⇓⇓⇓–9 and extrapolations can reasonably be made from these data when discussing PED treatment of unruptured internal carotid artery aneurysms with other clinicians or with patients. However the volume of published data on using PEDs to treat posterior circulation aneurysms is much smaller, and the carotid data cannot automatically be applied to this group. The Pipeline Embolization Device for the Intracranial Treatment of Aneurysms (PITA) study included only 1 basilar and 1 vertebral artery aneurysm,6 the Buenos Aires article had 3 basilar artery and 5 vertebral artery aneurysms,1 and the Budapest series had 1 basilar artery aneurysm.2 None reported ischemic or hemorrhagic complications in patients with posterior circulation aneurysms, and the posterior aneurysms were all occluded. In our study, PEDs were deployed in the basilar artery in 22 patients; 1 of these with 2 overlapping PEDs was in the normal basilar artery. Perforator territory infarctions occurred in 3 (14%) of the 21 basilar artery aneurysms, and in all 3, a single PED was used. No visible perforators were lost in these 3 patients. Perhaps there is sufficient flow demand to maintain DSA-visible perforators in the presence of a single PED. The PED is effective in the treatment of posterior circulation aneurysms that are otherwise difficult or impossible to treat with standard endovascular or surgical techniques. The major stroke and mortality rate was zero in this series, but minor permanent neurologic deficits were observed in 3/32 (9.4%) patients. Perforator infarctions were documented in 3 (14%) of the 21 patients with basilar artery aneurysms. The limited data available, including this study, suggest that a higher clinical perforator infarction rate is associated with use of the PED in the basilar artery relative to its more widespread use in the internal carotid artery. This serves as a reminder that though it is a very effective device, the PED should be reserved for cases not treated easily or effectively with balloon-assisted or scaffolding-type stent assistance. Disclosures: Jason Wenderoth—UNRELATED: Employment: ev3, Comments: I am one of the Asia-Pacific proctors for Onyx and the Pipeline Embolization Device manufactured by ev3. During the past 3 years, on 2 occasions, I have been paid a daily wage plus travel and accommodation expenses to travel to other cities to teach other physicians how to use these devices. Hal Rice—UNRELATED: Consultancy: ev3 proctor, Travel/Accommodations/Meeting Expenses Unrelated to Activities Listed: ev3 meeting sponsorship. Tejinder Singh—UNRELATED: ev3, Comments: Travel and accommodation only to attend the Neuroexchange meeting 2009 in Noosa, Australia. No money was paid to me or my institution. Victor Wycoco—UNRELATED: Travel/Accommodations/Meeting Expenses Unrelated to Activities Listed: ev3 sponsored a nationwide Pipeline Symposium in 2011 (to discuss international and national experience with the stent to date) where accommodation and travel was sponsored. No monies were given directly to me. This study was not discussed at the meeting. Stephan Meckel—UNRELATED: Board Membership: Member of independent Core Lab for Pipeline for Uncoilable or Failed Aneurysms and Complete Occlusion of Coilable Aneurysms trials, Comments: I received honoraria from Chestnut Medical Technologies Inc/ev3. Medical Device Alert: Intracranial Stent Manufactured by Balt Extrusion (MDA/2010/023). http://www.mhra.gov.uk/Publications/Safetywarnings/MedicalDeviceAlerts/CON076289. Accessed on 3 March, 2012. Accepted after revision April 5, 2012.